Let me first start out by saying, crying is completely normal for your baby. It’s how they communicate. And I know you are going to do anything in your power to help soothe your little one. When I had my first baby, the amount of crying was definitely not what I expected. I had this complete romantic notion of rocking and nursing my little little guy in our rocking chair and drifting off to sleep. Don’t get me wrong, there were definitely moments of this, but I really imagined a much more quiet peaceful situation. I think sometimes we can get caught up in the romantic ideas of motherhood. And the reality is that was not the case the majority of the time. Your ability to stop your baby’s crying has NOTHING to do with your ability as a parent. You are a great mom. You are a great dad. The fact that you are reading this shows that you want to learn all that you can for your baby. I know the topic of crying is a really big concern for many new parents. I remember I thought I couldn’t let my little one cry and thought I was traumatizing him even if I was present and trying everything in my power to help. The thing is… crying is really just misunderstood and hyped up in the media. And god forbid you google it. There are so many scary things people say out there that will have you second guessing EVERYTHING. Part of my job is to give you accurate information. And The American Academy of Pediatrics has a great guideline to think about crying and stress. They categorize it into three different levels. Positive stress responses. An example of positive stress would be your newborn crying because he is frustrated, not getting his way, getting shots, is hungry, etc. This crying or stress level is something he can manage in a stable environment with a loving caretaker — YOU. The next level they refer to as Tolerable stress. Think of a death in the family or a divorce… Again, very manageable in a stable environment with a loving caregiver who can give a baby or toddler tools for coping with this situation. And then we have Toxic stress. Now this is the type of stress that can actually change your little one’s brain chemistry. This type of stress is from frequent or prolonged periods of abuse, neglect, babies left in orphanages unattended, etc. Not from crying because you were in the other room going to the bathroom or taking a quick shower. 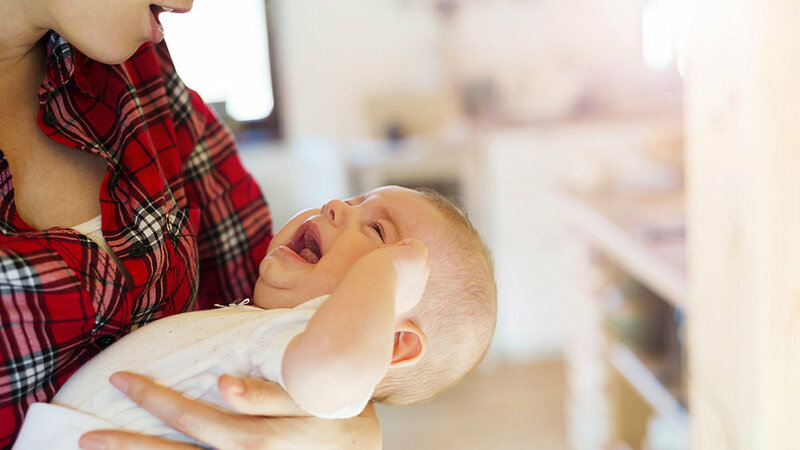 Of course no one wants to hear their baby cry, but I’d prefer a few days here and there or a week of some frustration (if and when you decide to sleep train) over long-term sleep debt for both you and your baby which is not good for your health or overall well-being. In fact, sleep deprivation is actually linked to postpartum depression, and when moms of babies go through sleep training interventions, studies have shown that postpartum improves or diminishes completely. I thought it was really important to understand the difference between stress levels and crying and what is actually harmful and what is NOT. So just another mention… your infant definitely needs your help in regulating stress especially in the early weeks after being born and should not be left on his own for prolonged periods of time. I know that you will do ANYTHING to stop your baby from crying. From nursing, to rocking, to bouncing, to going for a walk, to a car ride… I did too with my first. And once you found that thing, you will do everything in your power to do just that for EVERY single time you put your baby down to sleep. Now it’s ok in the early weeks/months to snuggle, bounce, and go for a walk with them while they sleep. You’re not creating any sleep associations yet… and you’re still creating that bond, that secure attachment. But what I want you to know is the more you use that ONE technique that has worked oh so well for you, in the longer run you end up overriding the development of any self soothing abilities. So, if you want to learn what you CAN do with your newborn, sign-up to learn all about newborn sleep in my Mastering Newborn Sleep class. No, it’s not sleep training either. Newborn sleep is very different than our sleep and babies of 3–4months of age. So, come learn all you can to set healthy foundations for sleep for your little one. You won’t want to miss it. And best of all… I’ll be answering your questions too! If you have a question about newborn sleep, or toddler sleep for that matter, go here to schedule a FREE 15-minute call with me, and we can chat about it!